Water Sacks, also referred to as water fruits, are projectile items appearing in Donkey Kong Country: Tropical Freeze. They resemble gigantic berries, almost the size of the playable characters. A Water Sack is plump and indigo-colored with darker spots on the skin and also sports a tiny receptacle on top of it, fenced with four leaves. Water Sacks are encountered on the ground and in stacks, which respawn after use, so the players can use as many fruit as they need. Every Water Sack contains some water, necessary to extinguish fire. Water Sacks can be carried and thrown by the Kongs; after being thrown, they burst and release water on the target. This can be a small patch of burning grass or dirt or a burning portion of a vine. Water Sacks can be weapons as well. The Kongs can catapult them towards enemies and can defeat them upon contact. A unique enemy species called Porcupal, whose members engulf themselves in flames at times, can be defeated with a single Water Sack for each member. On the other hand, in a stage called Rickety Rafters, there are targets which have to be hit with projectiles in order to trigger certain mechanisms. Most commonly, these targets have to be splashed with Water Sacks. 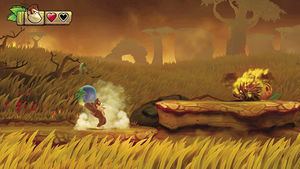 The only island in the game which hosts Water Sacks is the Bright Savannah, where they begin to show up in Scorch 'n' Torch, one of its levels. These items then reappear in subsequent levels of this island. ↑ von Esmarch, Nick, and Cory van Grier. Donkey Kong Country: Tropical Freeze Prima Official Game Guide. Page 25. ↑ von Esmarch, Nick, and Cory van Grier. Donkey Kong Country: Tropical Freeze Prima Official Game Guide. Stage 3-4: Scorch N Torch and Stage 3-A: Rickety Rafters (Island 3: Bright Savannah). This page was last edited on February 6, 2019, at 09:14.